If you are in the online business you know what a lead is, we hav smart ways of collecting, engaging and managing your leads all in one place and pushing them to different softwares that you prefer to work with. Optingun just holds all the lead data in the dashboard if you prefer it to save otherwise it will just process your lead and do not save anywhere in Optingun respecting your privacy, You can modify and/or delete any lead from the dashboard any time. Creating a new Lead in Optingun dashboard is just simple as saving a contact in your phone, once done the lead will be listed in the leads page, follow these simple steps given below to create new lead or manage existing leads. 1). Go to Top Menu and click on "+" Icon and click on "Add new Lead"
2). 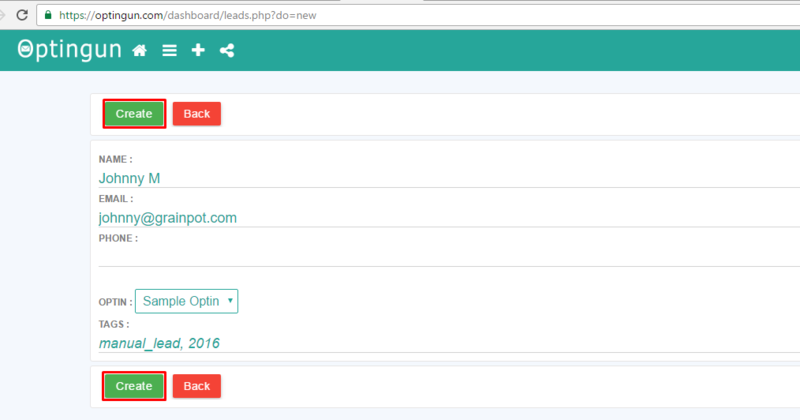 Now in the form put the name email and phone number of the lead that you want to save and choose the optin to which this lead should go in and mention tags if you want to and click CREATE button to save your lead, and now your new lead will be listed in Leads page. Go to top right menu and click on Leads to view all your Leads/Subscribers, on this use search box to filter the result you want to moderate, or click on the headers to sort based on that. First, Eye icon is to view this Lead details. Second icon, Pencil, this will take you to edit page of that Lead where you can modify the Details and other attributes. Bin Icon, the third one will delete the lead permanantly from the system.